The below movies requires QuickTime by Apple to view. You only need the basic free version, you don't need the Pro Quicktime to view these videos. It is recommended that you have Quicktime 7.4 or better. Rock fishing and testing a prop aboard Craig Wood new boat. SFDed Rockfish suffering barotrauma. Lake Tahoe Mackinaw fishing and family fun. Salmon Fishing late June at Moss Landing. movie Lake Shasta trout tournament. How to bait the MBR™ with a Shasta Tackle paddletail rubber bait, You would bait same way with minnow. mackinaw fishing video at Lake Tahoe with family. Trolling and jigging for mackinaw. New knot, it is quick slip knot called the Shelton Crazy Eight. It is a general purpose camping, hunting and boating knot that tied using a technique called inversion knotting. There are over a dozen different styles and techniques for tying the Shelton Crazy Eight. Here are a few of the ways and technique. The first movie is a long version and is more details. The second is shorter movie. How to bait up for trout. Bait hook for trout. More detail on saving fish suffering barotrauma below. Down load the 5 pages of the PDF files. 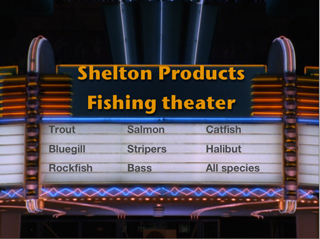 We hope you enjoyed Shelton Products pages. If you can't stop and buy anything, then honk your horn, smile, wave and email me at bill@sheltonproducts.com. as you surf by. We'll leave the email slot open for you.